Atelier Mandaline Stock Up Sale! 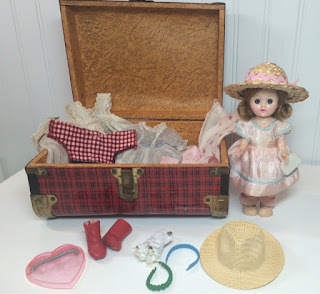 Dolls and toys are all on sale! In order to help everyone get ready for fall, I'm having a stock up sale in my Atelier Mandaline store. Save 25% on orders of $100 or more. The sale lasts through August 30th. 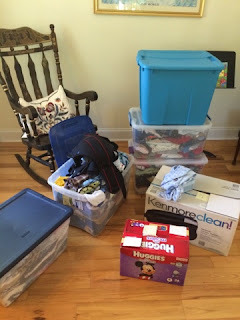 The store is packed with everything for baby, back-to-school, and I'm beginning to add fall and winter holiday items. All this baby stuff is on sale! 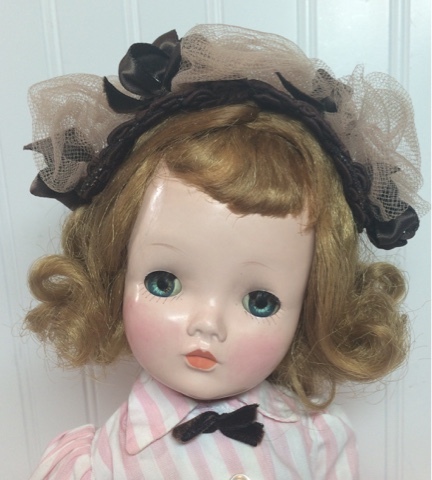 Get your holiday shopping finished early, especially if you have a doll lover on your list! This is a private sale, for my blog readers and newsletter subscribers only. To access the sale use this link. If you want to combine orders to reach the $100 threshold, add them to your cart and then go through to checkout. If you follow the link to the sale the discount will be automatically applied. Every department in the store is included! Please consider this a big "Thank You!" to you, my readers and followers. About two weeks ago we were preparing for a trip to Ohio when our youngest suddenly burst into tears during lunch and told us he wasn't feeling well. He was nauseous, with a fever and sore throat. I rubbed him down with the combo shown above, then gave him some DiGize for his belly and some of my homemade cough syrup for his throat, and sent him to bed. Within four hours he was fever free and feeling well and we were able to go on our trip. However, the second day of our trip he again felt sick. I had my oils with me and gave him the same treatment and he recovered and has had no further relapses. The oil blend I used is modeled after Young Living's M-Grain. I don't have that one, but I have many of the oils in it so I used those. I added ImmuPower to help the immune system heal itself. You can get most of these oils and the diffuser for a great price in the Young Living Starter Kit. 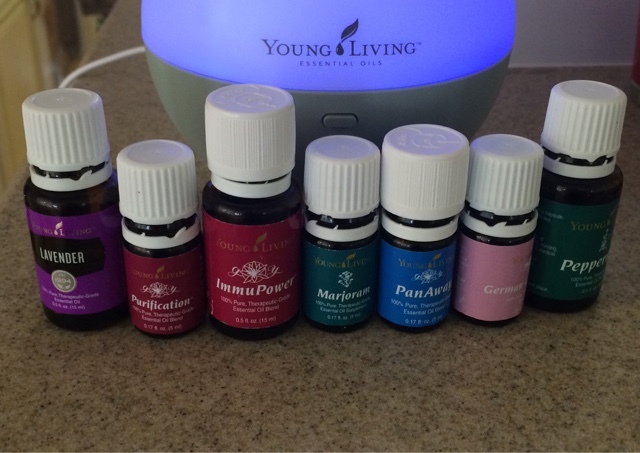 Once you're a member (through buying a kit) you get wholesale pricing on the Young Living products! Make sure to like my Naturally Amanda Facebook page for more great tips and recipes. Mix all the ingredients and rub on the forehead, back of neck, jawline, and the bottoms of the feet as needed until the fever breaks. Wintergreen oil may be added for extra pain relief. The essential oils can be diffused for further effectiveness. 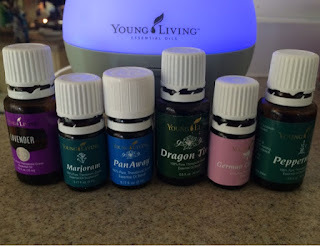 For women's hormonal or monthly headaches substitute Dragon Time for the ImmuPower. If upset stomach is present add the Stomach Upset Blend to the treatment. Mix the oils and rub all over the abdomen. Drink some more of the oils in water or take in a capsule as well for upset stomach. 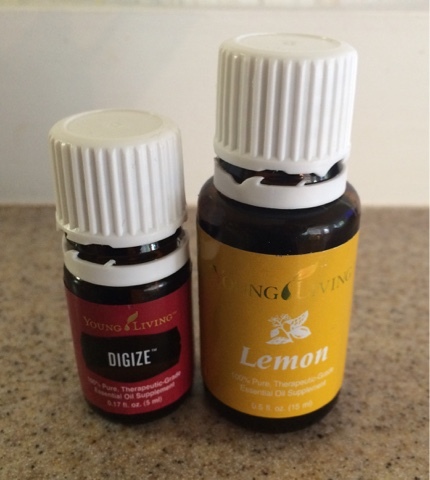 Peppermint oil may be added or substituted for the DiGize. A couple days after we got back home I was out for my walk and started feeling as if I were getting a migraine. I hurried home and by the time I arrived I couldn't see out of one eye, a classic precursor to a migraine. I was really upset, because I stopped getting the monthly migraines I used to have when I started using Young Living's Progessence Plus. Soon I was having chills and coughing, and then I realized it wasn't a migraine but most likely whatever my little one had earlier in the week. I mixed up the same blend I gave him, but with the addition of Dragon Time in case I was experiencing a headache caused by hormonal upset. I never actually even got the headache and I too was well in less than 24 hours. It's not surprising people are picking up germs; since the end of June we've been to Hilton Head Island, South Carolina; Savannah, Georgia; Nashville, Tennessee; Kansas City, Kansas; St. Louis, Missouri; Garner, North Carolina; and Covington, Kentucky/Cincinnati, Ohio. Every bit of this was road trip travel, so we've been all over the place and it's been all over us, literally. I probably should have rubbed everyone down with ImmuPower to prevent illness, but I didn't think about it. I've noticed an uptick in my allergy symptoms and headaches, most likely due to keeping irregular hours, not taking my oils and supplements as often as I should, and eating unusual foods. It will be good for all of us to get back to our normal routine. This past Saturday we drove to Hickory, North Carolina, about an hour away, to do some back to school shopping and let my son meet his girlfriend, who recently moved. On the way I noticed my husband seemed unlike himself and looked peaked. By the time we got back home that night he looked awful and was complaining he had such a headache his eyes hurt when he moved them. He then developed the fever and chills and cough as well, so clearly the same bug that afflicted the rest of us a week earlier. It turned out, when I questioned him, he had a headache the whole week but didn't mention it. He tried ibuprofen, cold medicine, and sinus medicine with no result, but did he think to try any oils? Of course not! When he was finally too weak to resist I rubbed him down with oils and turned on the diffuser. Since he waited so long and got so much sicker than we were I also made him drink a cup of Wolfberry Tea: Line the bottom of a mug with Young Living organic dried wolfberries. Bring water to a boil and pour about 8 ounces over the berries. Steep for 5-8 minutes and drink the liquid as tea. When you are finished drinking the tea, eat the re-hydrated wolfberries. My husband rarely gets sick, at least that he will admit, but when he does it's as if he's at death's door. He just doesn't do illness halfway. Saturday night he was just burning up with fever and shivering about half the night. He kept applying the oils and I ran the diffuser in the room. Around 2 AM the fever broke and he started sweating. I guess he was sweating the sickness out, I don't know. He tends to do this when he's sick. He put a towel on the bed but still by morning the sheets, duvet, pillows, towel, and several sets of his pajamas were wringing wet. He was fever free, though, and has remained so. Did the oils help his body fight off the illness? I have to believe they did, since he spent the week taking various pills that didn't help, but I can't prove it. The oils make me feel empowered in these situations though, so it's comforting. Although my husband was well on Sunday I was left with a big pile of sweaty, germ covered laundry. I machine-washed everything I could, but my husband's special orthotic pillow and our Chinese silk quilt aren't washable. Just a tip: if you ever find yourself in China, especially near Beijing, buy a silk quilt. These are duvet-type bedcovers made by pulling silkworm cocoons apart and layering the resulting fibers until they resemble polyester fiberfill or quilt batting. Once the silk batting is thick enough it's covered with fabric. The factory workers tried to teach me and the other women in our group how to pull the cocoons apart but we messed it all up and they had to re-do it. The blankets made this way are amazing. They are feather-light but really thick and soft. In the summer they stay cool and in the winter they are very warm. You can buy silk covers for them to make them even more luxurious. The only drawbacks to these are they can't be washed and all the sizes, like everything else in China, are too small for the corresponding Western beds. To clean them you are just supposed to hang them in the sunlight to air them out. Since ours was so germy I made a disinfecting spray. Mix all ingredients in a spray bottle and shake to blend. 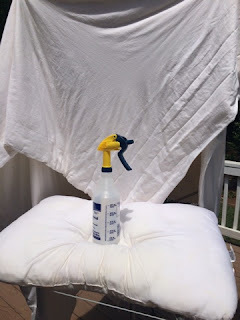 Spray lightly on linens and hang them in the bright sun if possible to dry. 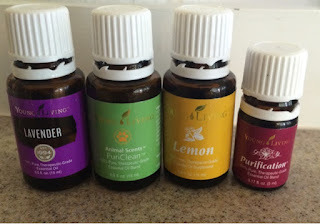 Young Living Thieves can be substituted for the PuriClean if desired. I used PuriClean from the Animal Scents collection, as this disinfecting blend is formulated to clean wounds to prevent infection. If you don't have that oil you can substitute Thieves, which also kills germs. Lemon in the blend helps get rid of stains, especially when combined with sunlight. I can't even tell you how good my bedroom smells right now. I sprayed the disinfecting linen spray on our mattress and bedspread and throw pillows in the room and ran the same oils in the diffuser. I changed the sheets and used a set that have been folded in my linen chest with lemon scented soap. Combined with the sunshine and fresh air scent of the silk quilt and pillow, the bed is so soft and clean. It's been a pleasure to walk into that room for days. Right now I air the linens and curtains and the linens and curtains and things about every 6 months, but I might start trying to do it weekly just to enjoy the smell! Bright sun helps clean the spray work even better. As I mentioned in my last post, I am selling an enormous amount of baby clothing on consignment from my sisters right now. I managed to work through just one size, 0-3 months, and have started in on the 3-6 months box. It's going well; there's some really cute stuff in the lot and I've had outfits sell within minutes of me listing them. You can find these terrific items, a complete wardrobe and gear for a baby boy up to 12 months, in my Atelier Mandaline store. I hope to have everything listed by the end of the week. The vest had a stain. Most of the clothing and stuff in this lot is in exceptional condition. My sisters and I were blessed to each have one or two boys within a couple years of one another, so we pooled all the clothing from the older boys into an extensive wardrobe. Since we had so many things in each size many items were rarely worn. Some, in fact, were never worn and are still new with or without the tags! A few items did end up getting stained or torn, however. It's simply unavoidable with babies, and especially with all these boys! I threw out anything too worn or stained, but if I find a good item I can repair I've been doing so. In this case I found a super-cute Gymboree sweater vest featuring a whale. This looked barely used except it had a stain on one side. I washed it but couldn't remove the spot. I noticed the original motif included little waves around the whale. I decided I could use duplicate stitching to cover the stain and add extra interest to the vest. I can see the picture on the vest was made with duplicate stitching at the factory; it's not knitted in. The vest's original picture is made with duplicate stitching. 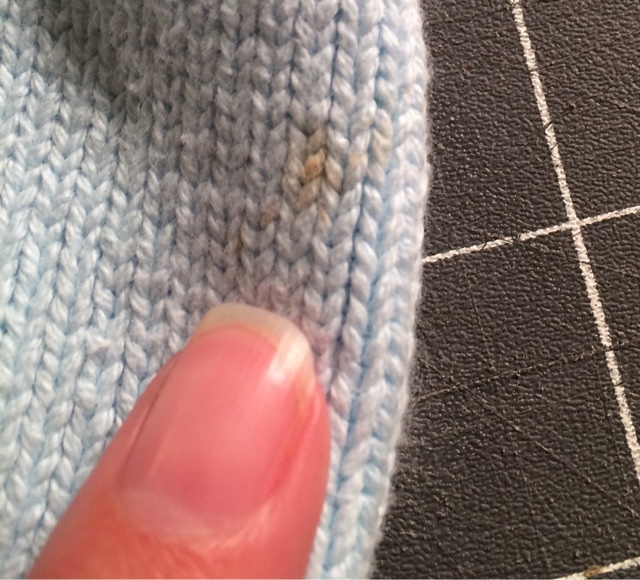 Duplicate stitching is a method of adding a picture to a sweater knit without actually knitting it in. If, for instance, you look at a Norwegian or Fair Isle sweater, those are created with what's called "stranded" knitting. In that case you wind several colors of yarn onto bobbins and knit them one or two or three at a time, switching from bobbin to bobbin to create the pattern, but carrying all the strands of yarn through the entire garment to make a thick cloth. Knitting, incidentally, was invented by men. Sailors and fishermen, adept at creating their nets through knotting, realized they could knot the strands more tightly, knit them in fact, into a nearly solid cloth. They figured out quickly that varying the pattern of the stitches to create textures like cable or bumps created pockets in the fabric that acted as insulation to help provide warmth on the cold sea (Guernsey sweaters are an example of this type of knitting). It was after that a short jump to the knowledge that by knitting in several more colors of yarn they could make a much thicker cloth. The pattern had to be tight and intricate so there wouldn't be big loops or sections of yarn hanging loose that could catch on things. These multi-colored, elaborate pattern knits are what we now know as traditional Norwegian, Scandinavian, or Fair Isle fabrics. It is possible to knit a picture into a sweater without actually carrying the colors the entire way through the sweater. Back when I had only one child I used to knit sweaters and blankets and things quite a lot. Nowadays I can't seem to concentrate well enough to do that; I drop stitches and mess everything up and have to rip my work out until I hardly know where I was. I find it much easier to use duplicate stitching now. We don't need the thick fabric for warmth here, at least not very often, so thin sweaters are more desirable anyway. 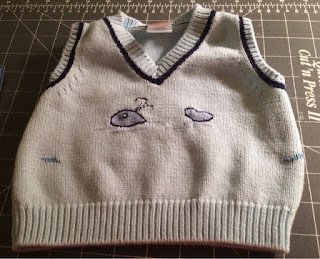 You can knit the sweater first and then add the duplicate motif or you can just buy a sweater and add a picture. Follow the original pattern with the new floss. 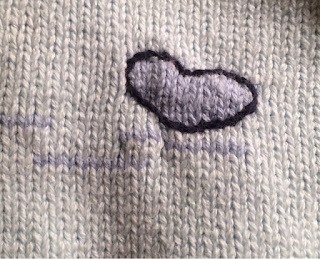 Duplicate stitching is about the easiest embroidery there is. First you choose a yarn or floss to make your picture or pattern. You can choose a contrasting texture (thicker, fluffier, etc) if you want a picture that appears raised, or you can try to match the original yarn size and weight to make the picture blend in as if it is knitted in. In this case I chose embroidery floss that's shinier than the rest of the yarn but about the same weight. I didn't have any matching yarn and I'm only getting my consignment fee of 30% on these sales so it wasn't worth buying yarn. To begin, once you've chosen your yarn get a dull-tipped embroidery needle. You need to choose one with a large enough eye to accommodate your fiber, obviously. 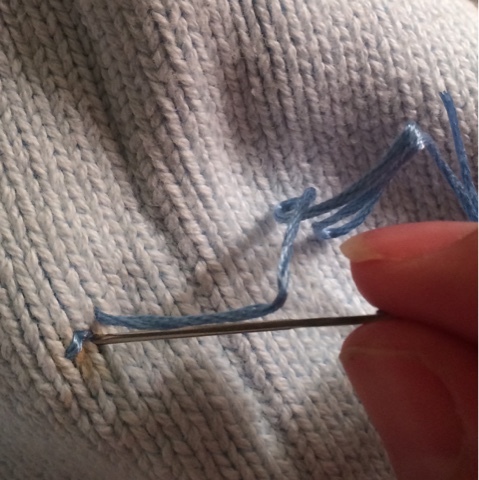 Knot your fiber and pull it up through the back of the sweater exactly where the stockinette stitch begins. The stockinette stitch is that typical sweater pattern that looks like tiny "V"s. Start at the center point of the V where you want to start your picture and then pull the thread over the stitch exactly. Then push your needle in at the upper right corner of the V. Then pull your needle back out to the front of the sweater through the center point of the next V and stitch up to the same corner where you went into the cloth before. 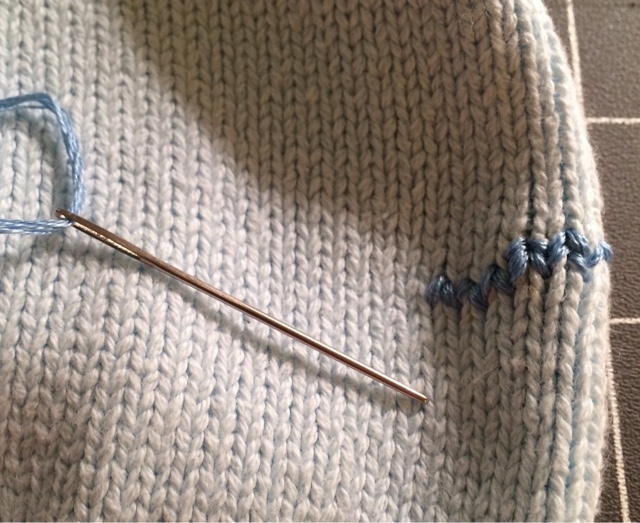 Push your needle back into the back of the sweater there. This is called "back stitching". Just keep following the original V pattern as you need to make your picture or design. When you're finished knot the thread off on the back side and weave in the tail. Use a dull embroidery needle. I did a second patch of waves on the other side of the vest to blend my addition into the overall motif. Gymboree used this same technique to make the whale and waves, though they used a raised embroidery stitch in a dark navy over the edges of the whale to create a raised outline. Once you've mastered the duplicate stitch you can also add more embroidery techniques to enhance your designs. 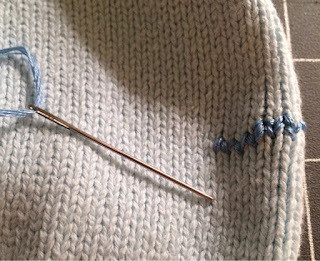 As you can see, it's easy and fun to add a personal touch to knits this way!